Former UW coach Steve Sarkisian will make his first appearance in a game in Seattle since leaving Washington in 2013. 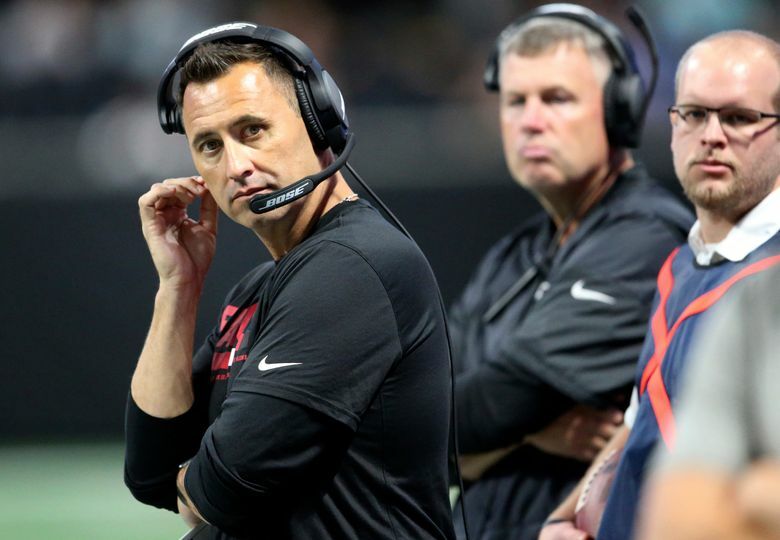 Steve Sarkisian wasn’t interested in taking too long of a stroll down memory lane this week as he prepares for his first professional appearance in Seattle since leaving the University of Washington as head football coach in 2013. Sarkisian’s only media availability this week in his new role as the offensive coordinator for the Atlanta Falcons came Friday as part of his regularly scheduled weekly meeting with local reporters there. And if he’ll experience any sentimentality when he steps in to CenturyLink Field Monday night — the same stadium where UW played all of the 2012 season as well as the 2011 Apple Cup — he kept it pretty well hidden. With that, the conversation turned quickly to other matters. Sarkisian’s recent past, of course, is one he’s likely done most of the talking about he ever wants to do. Early in his second season at USC in 2015 — the school he had come to UW from as an on-the-rise assistant in Dec. 2008 and then left UW to take over as a seemingly star-in-making head coach in Dec. 2013 — Sarkisian was fired after several instances of being under the influence at school functions or at work. It was as messy of an ending as possible, and one that left it unclear when, how and even whether Sarkisian could resurrect his coaching career. But a stint in rehab and some quiet behind-the-scenes meetings with coaches helped Sarkisian get back on track. Sarkisian took over as the offensive coordinator for the Falcons after the departure of Kyle Shanahan, who left to become the head coach of the San Francisco 49ers. Sarkisian spent last fall at Alabama where he was initially special assistant to the offense before becoming offensive coordinator for the College Football Playoff title game after Lane Kiffin took a head coaching job at Florida Atlantic University. Sarkisian had gotten to know Falcons coach Dan Quinn during Quinn’s time with the Seahawks. Quinn was defensive line coach in 2009-10 and then defensive coordinator in 2013-14 while Sarkisian was head coach at UW from 2009-13. When Sarkisian was looking to get back into coaching in 2016 he spent a few days with Quinn’s staff during the offseason attending practices and meetings, which Quinn said helped lead to his decision to hire Sarkisian when Shanahan left. Shanahan left big shoes to fill as the Falcons turned in one of the best offensive seasons in NFL history in 2016 on their way to the second Super Bowl appearance in team history. The Falcons scored 540 points in 2016, tied for the seventh-most in NFL history, and scored 40 or more points five times, second in NFL history. Quarterback Matt Ryan also averaged 9.26 yards per attempt, most in NFL history for a 16-game season and most in any season for a quarterback with more than 350 attempts. But if few figured the Falcons could stay at that level not everyone anticipated how much Atlanta’s numbers might drop. The Falcons are on pace for almost 200 fewer points — 250, or 21.9 per game compared to the 33.75 of last season — while Ryan is averaging 7.93 yards per attempt. Quinn, though, has publicly backed Sarkisian at every turn and did so again this week in a conference call with Seattle media. And it’s worth noting Atlanta is hardly woeful offensively —- the Falcons are eighth in yards per game at 268.0 and have the second-fewest punts in the NFL at 28. Quinn this week noted that one big change is that the Falcons are minus-three on turnovers this year compared to being plus-11 last season, meaning not as many short fields and easy points. Still, after some struggles last month, Sarkisian elected to start calling the games from the press box instead of on the sidelines. That’ll keep him out of sight of fans other than those who may show up early, when Sarkisian will undoubtedly bump into a few old friends during pre-game warmups, maybe none more important than Seattle coach Pete Carroll. It was Carroll who got Sarkisian’s coaching career started in earnest in 2001 when he hired him as an assistant shortly after Carroll took over at USC and who later promoted him to offensive coordinator in 2005, the job that helped springboard Sarkisian to UW. “I can honestly say if there is one person I can say that I wouldn’t be where I am today without that person, that would be Pete Carroll,’’ Sarkisian said Friday. Carroll’s assistance to Sarkisian was undoubtedly great during the time after his firing at USC and reviving of his coaching career, though neither wanted to delve into that this week. “Yeah, we did talk some,’’ Carroll said this week, leaving the answer there. The past, for the moment, anyway, best left in the past.